In last week’s article I spoke of why it makes more sense to follow the ancient custom of dividing the Mass into the “Mass of Catechumens” and the “Mass of the Faithful” instead of the modern nomenclature “Liturgy of the Word” and “Liturgy of the Eucharist.” This week I wish to reflect on the peculiar beauty of the very ancient custom of the silent canon and how it confirms the intuition that the Word comes to us in the liturgy in a personal mode that transcends the notional presence of the Word obtained by reading individual words from a book. The Introit quoted above strikingly brings together both of these points: the coming of the Word Himself in the midst of total silence. As I staunchly maintained in my lectio divina series last Lent, the Lord unquestionably speaks to us in and through Sacred Scripture, and we must constantly go to this source to hear Him; but He comes to us more intimately still in Holy Communion. The traditional practice of the priest praying the Canon silently emphasizes that Christ does not come to us in words, but in the one unique Word which HE IS, and which—immanent, transcendent, and infinite as it is—no human tongue can ever express. Once we have absorbed this fact in our life of prayer, the words of Sacred Scripture can, paradoxically, penetrate our hearts more effectively and have a more-than-Protestant effect on our minds. What I mean by a “Protestant effect” is the way that Protestants can listen to or look at Scripture again and again—e.g., John 6 or Matthew 16 or 1 Corinthians on the Eucharist—and yet their minds remain closed to its obvious Catholic significance. They are like the disciples on the way to Emmaus, who are thoroughly steeped in Scripture but have failed to grasp the central point, viz., the victory of the Messiah over sin and death. Jesus in person has to explain to them what they already “know” but have never internalized—and Jesus comes to us in person in the Real Presence and is internalized in the most radical way when we are permitted a share in His Body, Blood, Soul, and Divinity. When the “Liturgy of the Word” is vouchsafed a distinct existence as one of the two parts of the Mass, and particularly when this distinctiveness is enhanced by a gargantuan lectionary with often lengthy readings frequently detached from the other prayers and antiphons of the Mass, there arises the impression of a text that is free-floating and self-justifying, the reading and preaching of which can become the pastorally central arena, throwing the sacramental essence of the Mass into shadow. How often have we experienced the Liturgy of the Word ballooning to an overwhelming size, losing all proportion with the pulsing heart of the liturgy, the offering of the sacrifice and the ensuing communion? In many Masses I’ve attended over the years, the time used by the opening greeting, the readings, and the homily was some 45 minutes, while somehow everything from the presentation of the gifts onwards was crammed into 15 minutes. In the rush to be done (now that the gregarious and intellectually engaging business of readings and preaching is over), either Eucharistic Prayer II or III is chosen—prayers that are utterly dwarfed by the preceding textual cornucopia, seeming like a pious afterthought. The anaphora and its still point, the consecration, shrink and lose their centrality. How different is the motion of the traditional liturgy! It is a gradual escalation leading logically, one could even say ecstatically, to the Offertory, the Preface, the Sanctus, the Canon, the prayers after the Canon, and the Communion. Everything prior to this—the prayers at the foot of the altar, the confession of sin, the “Aufer a nobis,” the collects, epistle and Gospel, the Credo—is, and is experienced as, preparatory to something far greater, driving forward with eager longing to reach the fulfillment, the realization, of the word of God in the one Word which is God. The Creed stands as a textual centerpoint, which indeed it ought to be, since it is a divinely-authorized summary of the whole of revelation. Accordingly, it makes sense that everything up to and especially the Creed should be sung or spoken out loud, whereas once we reach the Offertory and the Canon, a decisive shift is made to silence, to the loving contemplation of the voiceless and eternal source of meaning behind the words of Scripture and the Creed. Yet with wonderful clarity, the Holy Spirit led the Church to introduce the elevation of the Host and Chalice, which wordlessly captures all that words could never say about the offering of Christ on the cross out of love for sinners. 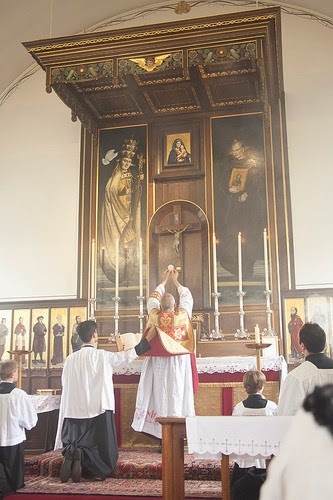 This host is elevated for us, for us men and for our salvation, for us to see and worship: “When the Son of man is lifted up, He will draw all things to Himself…” In the midst of the silence of the Canon, suddenly the bells are rung and the priest elevates the High Priest into the sight of all, the Eucharistic God-Man suspended between man and God, the victim whose death reconciles man and God (the significance of a crucifix over the center of the altar takes on its meaning here: the symbol of the death of Christ is “confronted” with its living Reality, the visible image is mystically confronted by its hidden Exemplar). This elevation speaks with a fullness that the silence of the Canon accentuates in the most dramatic manner possible. 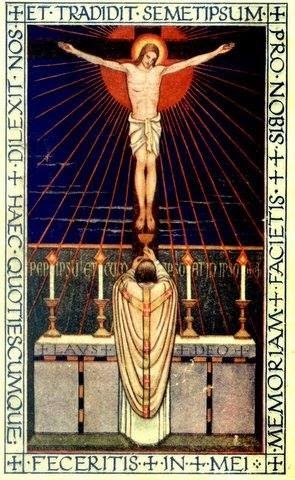 This profound silence at the very center of the Mass is just one among a thousand reasons why Christians hungry for the meat and drink of God find the appetite of their souls at once satisfied and provoked by the traditional Latin Mass. It has a word to speak to each of us in its magnificently arranged antiphons, lessons, and prayers, redolent of the weight of ages but fresh in the vigor of their human realism and supernatural savor; more than that, it has the Word without a word to overcome us and comfort us. It touches and stirs obscure depths in us where the Gospel has yet to be preached, transforming us with a gentle and terrible earnestness. Thanks be to God that this silence is increasingly speaking to more and more souls—souls fed up with the stream of verbiage and noise so characteristic of modernity and, sadly, of many liturgies that echo it. See my earlier article "The Silent Canon: Is Worship Supposed to be Aweful?" for a discussion of how far back this practice really goes—one more sign that the liturgical reformers of the 1960s were not really in the business of restoring ancient practice but more intent on introducing novelty. See my article "Lectio Divina: Liturgical Proclamation and Personal Reading" as well as the links to other parts of the series listed there.